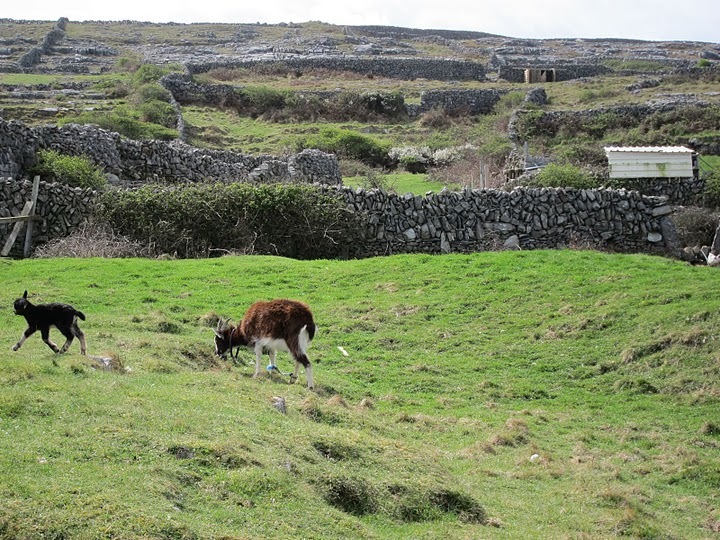 Poet and blogger Tom Clark sent me these two photographs of Irish scenes. They are part of a marvelous collection all taken by Juliet Clark, Tom’s & Angelica’s daughter, who spent three weeks driving round the country last April. I love the goats’ hole in the hedge. All these goats have much longer tails than ours. We all felt bad to hear about (and see) the hobbled goat. (It appears, in a closer view, to have some sort of bandage wrapped around one hoof.) Being kept company by the frisky young one must count as consolation, though. That touch of cartographic poetry would surely have warmed the heart of the Gaelic bard Uileog Ó Céirín, or Ulick Kerin (1791-1863), of County Kerry, who is supposed en famille to have been an ancestor of my maternal grandfather. 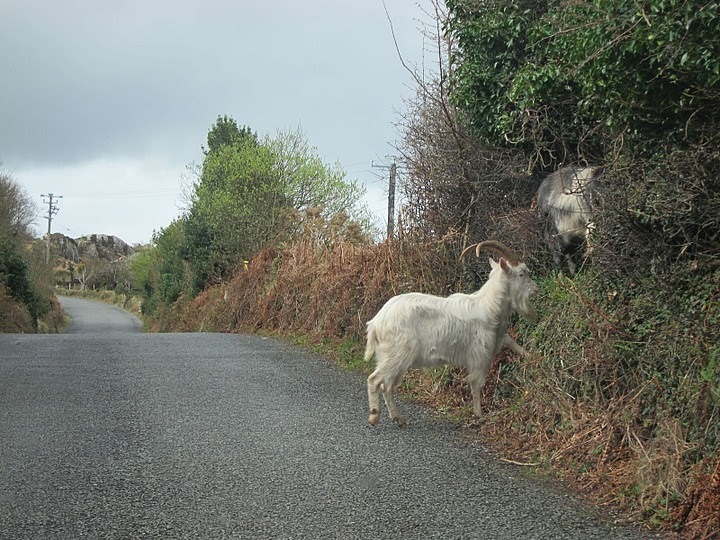 Who in turn would have been delighted by the tales of Juliet’s enterprising adventures among the goats, sheep and other present day inhabitants of some of the wilder parts of the Emerald Isle, and by this post. Yes, I’ve been thinking a lot about it, and I decided 1) it’s better than being indoors, or on a long string, because it can at least go where it wants, if a bit slower than usual, and 2) we don’t know the whole story. Maybe there’s a good reason why it can’t be loose at the moment; as you say, it might have a bandaged leg. I wish I were related to a Gaelic bard. I once heard something about being related to an official in a nineteenth-century Irish bank, but it’s not the same at all. I don’t know whether Juliet’s pictures are still on display anywhere. There’s a lovely one of two hens by a sliding window, and one of a picture in a museum of a fluffy little dog that’s labelled “Dog Skeleton”. Sorry to break it to you, Tom, but I got the impression that the various hobbled goats of Inishmore were less “consoled” than annoyed by their young companions . . . Thanks for the link, I’ve added it to the post. They’re great pictures. That blue does look like a bandage, poor old goat. In my experience goats aren’t sentimental, but they really do appreciate the company of other goats. Vesla and our last Faverolle hen, Cloudy, both seemed to enjoy sharing the same sleeping quarters, on the opposite side of a knee-wall from the other goats. Thanks, Juliet, Tom and Crown for those wonderful pictures! I love all the old ruins and the lonely donkey -have you seen the donkey?! I saw the donkey. And the sheep. Julia, don’t miss dearieme’s cow video in the last comments. I need to go to another machine to watch dearie’s video, this has not speakers now! But I won’t miss it! Those sheep may have been pretentious, but they were doing a beautiful job keeping the grass cut evenly. I’m always having the news broken to me by my friends and I always appreciate their patience. Said the old Irish Goat. This would perhaps resemble the hobbling device in question? About the pretentiousness, would that we were all as useful as those lawn-mowing Irish sheep! You’re both absolutely right, may we all be as useful as those sheep… and have that fluffy white wool! If only the goats would mow the grass like that. A fantastic link, Tom, specially for those with uncoperative goats! How are your girls, Crown, in that matter? Angora goats don’t give milk except to other goats. I can see the hobbling thing might be quite useful when we’re trying to mow their wool. We have to turn Vesla upside down to do her tummy, and she goes all floppy, like Gandhi. But Gandhi was said to be overcome by fits of giggling, in moments like that. Somehow one imagines Vesla to have a bit more… what would the word be? Dignity? I can’t imagine Vesla giggling. She can be very picky about her food, she won’t try new things like plums or apples, but that’s not exactly undignified.